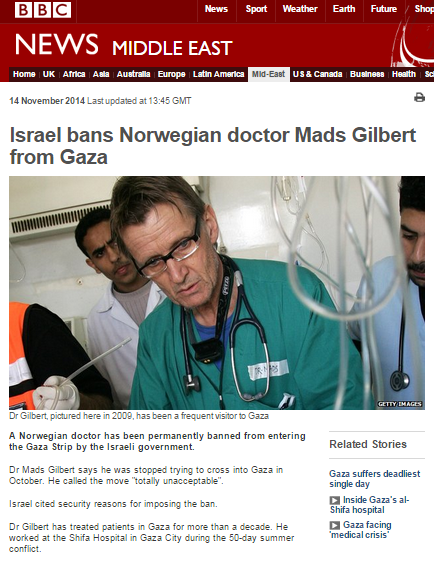 Not content with having misled audiences worldwide on December 31st by propagating the inaccurate notion of a ‘ban’ on Israeli author Dorit Rabinyan’s novel ‘Gader Haya’, the BBC World Service has continued to promote more inaccurate information about that same story. “…during her subsequent conversation with the book’s author, Doucet makes no attempt to relieve listeners of the inaccurate impression given by Dorit Rabinyan that the decision not to include the book in the curriculum was made by politicians rather than by a pedagogic committee. Neither does she challenge Rabinyan’s later inaccurate and misleading allegations concerning the significance of the committee’s decision. Both those statements are inaccurate and misleading. Rabinyan’s book was never on the school curriculum and it has not been ‘barred’. The synopsis to the January 8th edition of the BBC World Service programme ‘World Have Your Say’ is equally inaccurate and misleading. As has been the case in all the BBC’s coverage of this story, no effort was made to inform audiences what the literature curriculum in Israeli schools does already include. Writer Liel Leibovitz recently provided some insight into that topic. Only one of this programme’s six interviewees was a Jewish Israeli and Tilley twice noted that it was “a real challenge to get an Israeli Jewish perspective”. Although the topic of gay relationships did feature in the conversation, the fact that three of her gay Arab interviewees live in the Tel Aviv area did not prompt Tilley to enquire about the level of tolerance for gay and/or mixed couples in their home towns. The impression listeners to this show received from the personal stories of participants was overwhelmingly that their Muslim Arab families are far more tolerant of mixed relationships that the Jewish families of their partners. As usual, listeners to the programme were invited to participate via social media and as has all too often been the case in the past, the ‘World Have Your Say’ Facebook page moderators failed to handle offensive comments appropriately. While this story has been covered very generously by the BBC, it is starkly obvious that the corporation’s interest in it has been fueled primarily by the opportunity it presented to promote existing politically motivated narratives of a ‘dark’ society which ‘bans’ books, ‘silences’ free speech and frowns upon the multi-cultural icon of racially mixed relationships. So keen has the BBC been to promote that narrative that its reporting has failed to meet the basic editorial standards of accuracy which would supposedly have ensured that audiences would not be repeatedly fed a story about a ‘book ban’ which does not exist. 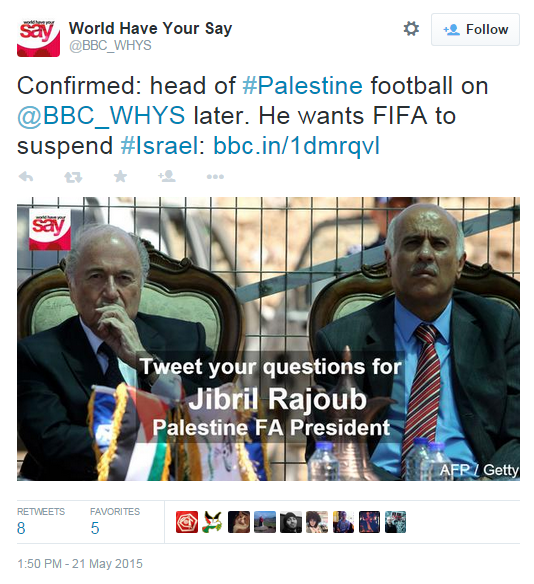 In addition to the context-free promotion of Jibril Rajoub’s latest sports related assault on Israel’s legitimacy recently seen on the BBC News website, listeners to the BBC World Service radio programme ‘World Have Your Say’ were also treated to a dose of unhindered propaganda from the head of the Palestinian Football Association on May 21st. 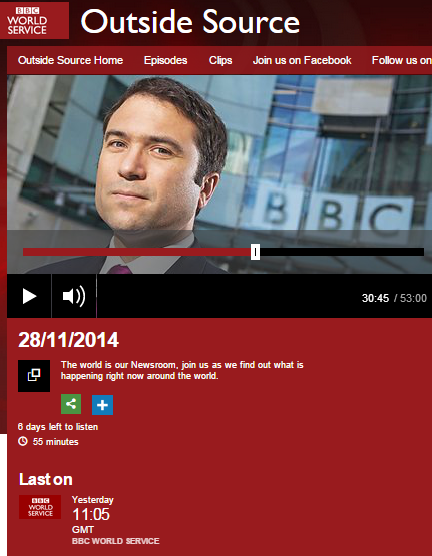 The item can be heard from around the 40 minute mark in a podcast here or here from 43:48. With no intervention from presenter Chloe Tilley, the segment opens with almost two full minutes of a diatribe from Rajoub which is replete with distortions and falsehoods, including accusations of “humiliations” and “racism”. When Tilley does finally interject, it is to ask Rajoub whether he thinks FIFA understands “those pressures on Palestinian teams, on players, on fans?” and once again Rajoub uses the opportunity to promote the inaccurate notion that the underlying issue is Israeli “racism”. 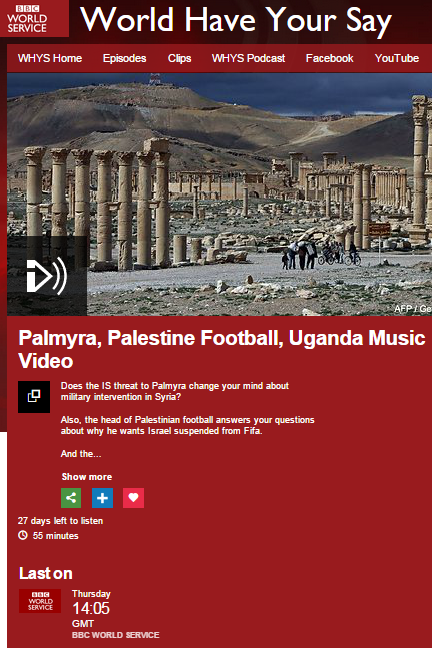 Listeners also hear a contribution from a partly identified football fan from Dubai who, in addition to promoting his own context-free, cherry picked claims, states – with no challenge from Tilley – that it is hard to be a fan or a player “in the context of the occupation and the apartheid”. Also notable is Tilley’s failure to insist on a proper answer from Rajoub concerning a point raised by the one Israeli contributor to the programme and her presentation of the issue with the use of the phrasing “naming a fencing competition after – in his words – a terrorist”. Throughout almost ten minutes of airtime devoted to this topic listeners did not get to hear the official Israeli view of this story and at no point did Chloe Tilley attempt to make audiences aware of the all-important context of issues concerning Palestinian football players with links to terrorist organisations. What listeners did however take away from this embarrassingly superficial and uninformative item were unchallenged labels such as “racism” and “apartheid” – another brick in the wall of BBC enabled delegitimisation of Israel. No further introduction was given – not even a surname – and so listeners were not able to put the contribution of Najla Shawa (now working for Oxfam and previously an UNRWA employee) into its appropriate context, including her endorsement of Doucet’s previous inaccurate and context-free statements. Shawa also made plenty of context-free statements of her own, with no attempt from Chloe Tilley to rectify that problem. According to the CIA World Fact Book there were some 753,000 children aged between 0 -14 in the Gaza Strip in July 2014. Doucet failed to provide any factual evidence for her unsourced claim that the “vast majority” of those children “have seen loved ones dying before their eyes” and “their homes destroyed”. Likewise, her egregious promotion of the “world’s biggest prison” trope and the notion that “there’s no exit from Gaza” is contradicted by the fact that 8,708 Gazans used the Erez crossing to exit the Gaza Strip in January 2015 alone. 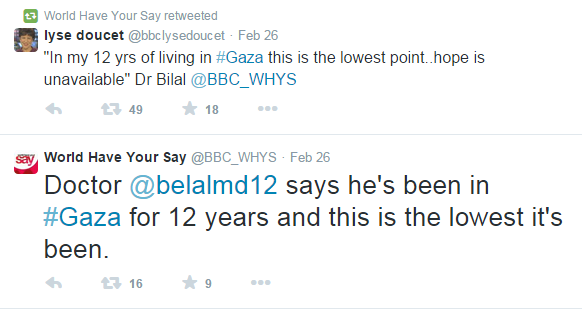 The programme’s next guest was the controversial UNRWA spokesman (and former BBC employee) Chris Gunness . Indeed that article was promoted by the BBC on Twitter and Gunness repeated some of the same themes in his contribution to this programme after having clarified his place in the very cosy echo chamber. After Gunness’ portrayal of the failure of donors to meet the pledges made at last year’s Cairo conference and his own organisation’s activities, Tilley introduced another contributor – Nuraddin Biladi [phonetic] – described as “associate professor at the College of Arts and Sciences at Qatar University”. Relating to the question of why his country had not met its financial pledge to the reconstruction of Gaza, Biladi noted that donors were “outstretched” due to the numbers of refugees from Syria and Iraq and also cited the issue of ISIS as having affected the policy makers in the Middle East, Europe and the US. 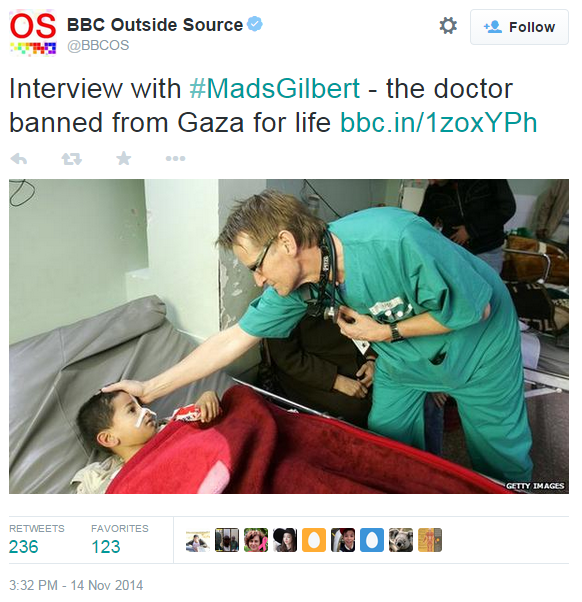 Yes, dear readers: the BBC World Service actually did broadcast Chris Gunness’ transparent attempt to portray Israel and Israeli self-defence against Palestinian terrorism as the root cause of Jihadist extremism throughout the Middle East and beyond. Ironically, the next segment of the programme involved Gunness making repeated declarations about UNRWA’s ‘neutrality’ which he claimed “we take […] extremely seriously”. Gunness claimed that “no-one has ever produced any evidence whatsoever” that building materials intended for UNRWA have been commandeered by terrorist organisations but neither Doucet nor Tilley asked him to comment on the documented evidence of building materials supposedly safeguarded by the UN supervised mechanism being sold on the black market in Gaza. Gunness’ political campaigning then shifted to an old theme he has promoted via the BBC World Service on at least one previous occasion. Again, neither Doucet nor Tilley made any effort to correct the misleading impression given to listeners by Gunness by informing them that exports are in fact transported out of the Gaza Strip. In January 2015, for example, 804 tons of merchandise left the Gaza Strip. If the aim of this programme had been to inform listeners worldwide about the real reasons for the slow pace of reconstruction in the Gaza Strip then obviously it would have failed miserably. But that outcome was of course entirely predictable, with the choice of three guests (two of whom were inadequately identified) all subscribing to the same politically motivated point of view together with the heavily featured context-free propaganda from Lyse Doucet ensuring that the emotion-laden take-away message absorbed by audiences contributed little to their understanding of the background to the situation as it stands today. It is therefore not difficult to determine that the provision of accurate and impartial information to which the BBC is supposedly committed was trumped by the opportunistic use of half an hour of this programme to promote a particular political narrative. The BBC clearly needs to explain to licence fee payers why that is the case. 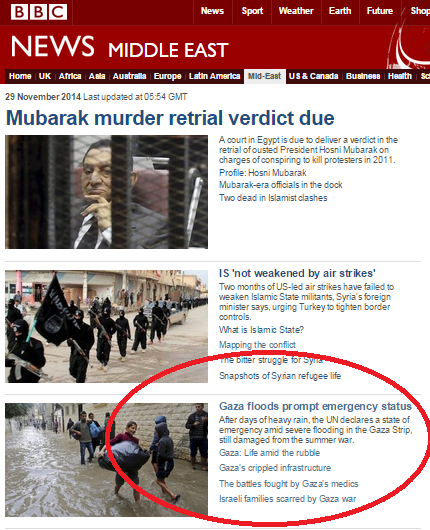 As regular readers know, whilst the BBC has still not comprehensively and accurately informed its audiences what happened during the battles in the Gaza Strip neighbourhood of Shuja’iya in July of this year or why the fighting there was so intense, it has – on the other hand – devoted much airtime and column space to context-free depictions of the destruction of buildings in that district. 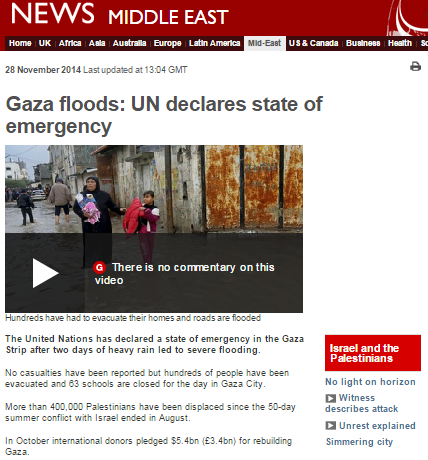 November 28th saw the continuation of that practice in an article which appeared on the BBC News website’s Middle East page under the title “Gaza floods: UN declares state of emergency“. That report was presented on the Middle East page together with links to four additional items of recommended reading which included Yolande Knell’s problematic feature on Shuja’iya from September 15th and her August 19th report “Gaza’s infrastructure crippled by conflict“. “Shejaiya’s infrastructure remains extremely damaged since the summer conflict”. No mention was made of the very relevant fact that Shuja’iya was the location of considerable Hamas infrastructure, including the entrances to numerous cross-border attack tunnels, weapons stores and missile launching sites. Also evident in this report is the BBC’s continuing practice of quoting old UN statements on the subject of civilian/combatant casualty ratios in the Gaza Strip which were already problematic at the time they were published and have been shown to be even more so in the light of subsequent research – completely ignored by the BBC – which indicates that the ratio between civilians and combatants is similar. 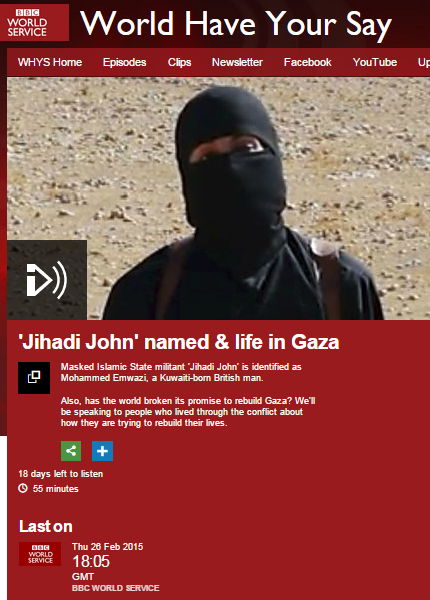 As has been pointed out here before, the definition of the term ‘siege’ does not accurately describe the restrictions on the import of dual-use goods with the potential for use in terrorist activities which is applied to the Gaza Strip by Israel and yet, as we see, that Hamas-favoured terminology is still being used by the BBC. 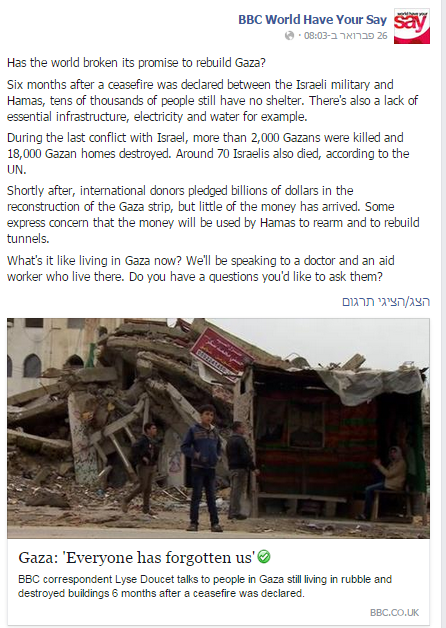 And what of Alkashif’s claim that Israel is not allowing building materials for reconstruction into the Gaza Strip? Let’s take a look at just a few of the recent reports from COGAT. On November 23rd 2014, 311 truckloads of goods entered the Gaza Strip, 94 of which carried 3,760 tons of construction materials. On November 20th 2014, 403 truckloads of goods entered the Gaza Strip, 93 of which carried 3,720 tons of construction materials. On November 18th 2014, 340 truckloads of goods entered the Gaza Strip, 101 of which carried 4,002 tons of construction materials. On November 17th 2014, 274 truckloads of goods entered the Gaza Strip, 99 of which carried 3,960 tons of construction materials. Whilst the situation in the Gaza Strip may be far from ideal, it is certainly not accurate to say – as Alkashif does – that there is no electricity or clean water there at all. Obviously Shahdi Alkashif’s reporting is neither accurate nor impartial and the BBC World Service needs to urgently correct the inaccurate impressions given to its listeners.